Tax season is coming to an end and returns are ready to be spent. What will you spend your refund on in 2018? Well April is here and you are either getting your tax information together because of the looming deadline or you are waiting for that refund to hit the mailbox or bank account. Now is the time to be thinking about a wise way to invest that “new-found” money. Some will see it as a windfall for a shopping spree. And some will see it as a chance to invest in their home or family. We think it would be wise to to clean up the outside of your home for beauty and the overall health of your home and family. Is your roof stained? Is your siding or brick exterior a different color than when you moved into your home? If the answers are “yes,” your house is actually aging faster due to the build up of grime and algae? 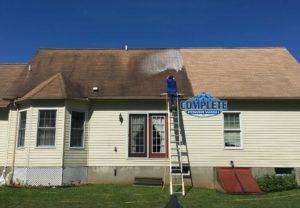 If the answers are “yes,” then you should seriously consider a professional pressure wash cleaning from the professionals at Complete Power Wash. Our softwash technique of low water pressure, combined with gentle detergents, is best for cleaning stained shingle roofs and all types of exterior siding. Now, look beyond your roof and siding. How does your fence look? What condition is your deck, gutters, sidewalks, driveway. Are these dirty and covered in grime? A thorough cleaning will not only make them shine, but remove the microbes that can cause airborne health issues for your family. Clean gutters will ensure that rain water flows away from your home, not down the walls and into it. It takes very little moisture for mold and mildew to take hold and then cause thousands of dollars in damage, not to mention triggering health issues like asthma. If you would like to spend your tax return on a professional power washing of your home, contact the Complete Power Wash. Our techs are the exterior cleaning experts in the Hagerstown, MD and surrounding Tri-state area of West Virginia and Pennsylvania. We use the softwash technique — low water pressure combined with gentle, environmentally-friendly detergents — to clean every type of surface found at homes and businesses in the region. To contact us about a free pressure washing estimate, call 301-842-2290 or contact us online, just click here.